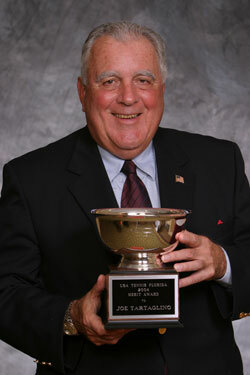 USTA Florida regrets to announce the passing of Joe Tartaglino, a respected man who, over the past 25 years, has made a great contribution to amateur tennis throughout Florida. Joe has been involved in a variety of tennis-related activities, ranging from serving as co-chair of the Junior Orange Bowl Tournament to working as an official. Although he had been active in tennis for years, Joe raised his volunteer efforts in 1993 after he retired from IBM. Since that time, he has contributed his time and talent to a range of district, sectional, and national USTA committees. As chair of the USTA Florida Technology Committee in 1995, he was an early advocate and designer of the section's award-winning website. He joined USTA Florida’s Board of Directors in 1998 and also served as chair of the Strategic Planning Council. In addition, Joe has served membership stints on the officials, marketing, budget and finance, awards, and nominating committees. In his role as an official, Joe became a national referee, earned an ITF Referee White Badge in 1995, and served as president of the South Florida Umpires Association from 1997-2001. He was a sectional trainer/evaluator for officials and has volunteered on the USTA Information Technology Committee (1999-2000), the Advanced Media (Internet) Committee (2001-2004), and the Officials Committee (2001-2004). His efforts, willingness and cooperation has earned him the admiration and honor of the entire USTA Florida family. Please show your support for him and his family. Joe’s funeral service took place Thursday, March 22 from 6:00 p.m. – 8:00 p.m. at the Deltona Memorial Funeral Home. A church service followed at St. Anne’s Catholic Church on Friday, March 23, starting at 11:00 a.m.